A mom friend of mine, Anne, from our kids' school is also the owner and mastermind behind Seattle Sundries, where she sells soaps with the most unique names and designs. An immense amount of thought goes into all of her products and their ingredients and it definitely shows. Seattle Sundries' soap is GREAT for shaving... smooth with creamy lather. The shaving set comes with a black ceramic shaving mug, a badger hair shaving brush with a faux ebony handle, and TWO BARS of frothy shaving bliss (of your choosing). Each bar is 3” wide and just over 1” deep weighing 4 ounces or more. As with all handcrafted artisan soaps, there may be some variation in color and slight irregularities in shape. This is a result of being cut and trimmed by human hands rather than by a machine If you find that your soap “sweats” when left out, don’t be alarmed. It’s simply the natural glycerin in the soap attracting moisture from the air. If you need some tips on how to build great shaving lather, read our blog post on the topic! Seattle Sundries is known for its Backwoods Soap, Pottymouth Soap and Sasquatch Soap that's rumored to help "tame the smelly beast in all of us." Her bars were also featured on Pioneer Woman's blog a while back (if you want to see 8 billion close up photos of the soap :). You can even work with Anne to create your own custom soap with private label, which makes for a great holiday gift as well. Hmmmm... maybe I should have her work on a "Clean your Duker" soap to give out to everyone for the holidays this year. Anyway, if you are interested in being entered in the Shaving Gift Set Giveaway, to be chosen by the random number generator, add your name to the comments of this post and let me know which soap from her site you would like to try. I think they are all fantastic, so it's going to be hard to choose! You have until midnight Saturday PST, December 4th to enter. Good luck! I've also never tried anything from her shop either BUT being a fellow blogger and avid FB user - she WILL be posted now only because the names of her soaps are CLASSY!! mostly because it has espresso grinds in it and working for a coffee roaster I love to see "waste" like that put to good use! I would LOVE to win this shaving kit though because my hunny would use a fancy NATURAL shaving option. I think I would like Hard Working Hand Soap the best, although I'm not sure it is the one I would choose to shave with. Either way this is a great giveaway, Thanks for hosting. Highland Fling! It sounds great for my man's face. I imagine that I will smell just like the fisherman just returned from the sea. I'm feeling all butch suddenly. Really hard to choose! But I love the Buck Naked Soap. It is just SOAP... buck naked. Amazing! Lavender Lover sounds amazing, but I think for the sake of my sasquatch-resembling husband, I'd go with that! The Old School Shave Soap would make a perfect gift for my dad! Ooh, what a great resource! My husband started shaving with a brush about a year ago. He could use some great soap, maybe the Old School Shave Soap. Although, the Lap of Luxury soap has me cracking up! What a great gift idea! Manly Man Soap sounds like just the thing for my man. Since my husband already shaves the 'old fashioned' way, this would be a nice replacement for the old ceramic cup. And since we are planning on full time RV'ing soon, the Road Trip soap would be my choice - followed by Backwoods because we are big hikers! My eldest son is on the verge of needing to shave and he LOVES "old" stuff (anything that looks vintagey). This would be sooooo perfect for him! Thanks! I would have to choose the Cowpoke soap because my husband is a recovering cowboy! BTW: My husband uses an old fashioned safety razor (when he has time in the morning) and loves using shave soap and brush. He said that's the only good thing about shaving! Too cute! We'd love the Old School Shave soap, since my husband uses the ole brush and mug! But the Naughty Nellie and Sasquatch are hilarious! Just lost my shaving mug to a bad day with the hand held shower wand. 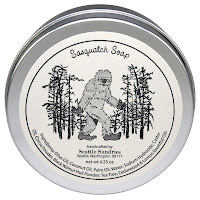 the Sasquatch Soap sounds neat! Oh, I love this site! We'd have to try the Manly Man soap. *tee hee* How cool. Hubby would love the Smooth Shave Soap. He is already a fan of shaving the old-school way, so this would make his day. I have never tried this soap before but would love to smell the Manly Man soap, especially with lime in it!!!! My V-boy is a brand new shaver (just the mustache smudge, every couple of weeks :-) I would choose the Manly Man soap, 'cause I want him to get over the Axe addiction and away from the chemicals, and give him some real smells to enjoy. Terrific!!!! I'd like to try the highland oatmeal soap1 looks wonderful! Oh I think I would try the Bitchin' Kitchen Soap. My poor husband's shaving mug has cracked and his brush is dying an ever accelerating death - our 2 year old LOVES daddy's shaving stuff a little too much. He would love the old school soap kit! Sasquatch Soap, my husband loves soap with Tea Tree. I would love to try the Highland Fling soap. I would love to win the giveaway. Bitchin' Kitchen for certain. My class is trying to convince me to give up my massive coffee addiction but I don't think any of us would survivie the experience. Hmmm, it would be a tough toss up between the Sasquatch soap and the Haute Goat soap . . .both so intriguing! My husband would really dig this set, thanks for the giveaway! They all seem so good! I love the idea of washing my cares away in a bathtub so Lap of Luxury is the one I would like to try. I would like some Exotic Escapades soap ... clean me right up. Had to look at all the labels,they're really fun -- tough decision! Gonna say Highland Fling and Buck Naked. Wow! Neat stuff! I like the Bitchin' Kitchen soap! I would love to try the Lap of Luxury soap. Sounds luxurious! Thanks for doing the giveaway Crunchy. I'm in. Buck Naked Soap. Oh, this sounds great! I have a teenage son who needs to start shaving - what a great way to get him started! Definitely Sasquatch for him! I would love to try the Lap of Luxury soap. Sounds like it will smell so good. I would love to win this for my husband to have for Christmas. Trying to green him up is almost impossible but this would be very cool to give him. The sasquatch sounds great... I love it! I would love to smell the lap of luxury soap on my husband's fresh shaven cheeks. Good gift idea! For my husband I would probably choose the smooth shave soap. Mmmm...the Exotic Escapades for sure! I like the Gardener's Gold Soap. Since I do so much gardening this would be awesome. I'd love to get some smooth shave for my boyfriend! smooth shave soap or filthy rich shave soap look perfect. with the afternoon I had it is best if I don't have the "potty mouth soap"...I think a certain little boy in the household would have been using it today! If given the chance I would try the Smooth Shave soap. I am sure...positive in fact...I would *LOVE* the Road Trip soap that Anne makes. It has all the wonderful, yummy smells that I already smell like and love!! Please enter me! I am sure my man would appreciate some damn good soap! Since losing the charging base to my husband's electric shaver, he's been using cheap razors. I'd love to give him the Smooth Shave soap set. Potty mouth looked like it had a good scent. Also, I almost freaked out by the amount of palm oil, but she specifically gets her palm oil from farmers practicing sustainable plantings. I would love to give my husband the gift of Manly Man Soap. We are back to basics and stick with Ivory (or whatever is on sale) right now, so to try a rich soap like the ones from Seattle Sundries would be decadent! Sounds fun! I'd be interested in the hardworking hand soap. I've never seen her site before, but it looks like great products! I'd have to choose the hard working hand soap. I hate when bike grease leaves my fingertips black. Thanks for offering the shaving giveaway. I'd like to try the Haute Goat soap! I like the sound of the Backwoods Soap, and I'd love to let my partner try it out. I would like to try the Rejuvenation Soap. I definitely need to be rejuvenated! Oh so many wonderful choices, I think I am in love with this website!!! Thank you for the giveaway and especially for turning me on to a great website. My boyfriends has been making his own shaving soap for a while now, but I would like to introduce my dad into this healthier option. Count me in! the filthy rich shaving soap and the new shaving soap ingredients look very good. the whole site is nicely done. I would love to win this kit for my fiancee, and I think he would enjoy the old school shave soap! Having trouble deciding between the road trip soap, naughty Nellie or sasquatch. Maybe I'll go with the road trip soap, if it smells a little like incense hubby would probably love it. I think I'd have to go with Cowpoke soap, because we're moving to the side of the country with mosquitos and ticks! I adore all the names and graphics, btw! I would have to go with Exotic Escapade, since I love frankincense. What a cool present this would be.My dad would like this shaving kit. I'd like to try the "Potty Mouth Soap" because of the name, lol.